REIDsteel were privileged to welcome representatives from the Government of Ghana Health Select Committee to tour our five acre site and to view the design and fabrication of the latest hospital for which we are providing the design, fabrication and shipping of the steel frame and roof cladding. REIDsteel are working as part of the team established by NMSI. This consortium specialises in systems, design and engineering, logistics, procurement and project management. They welcomed the Ghanaian delegation to Britain via London before travelling to Poole and then on to REIDsteel. 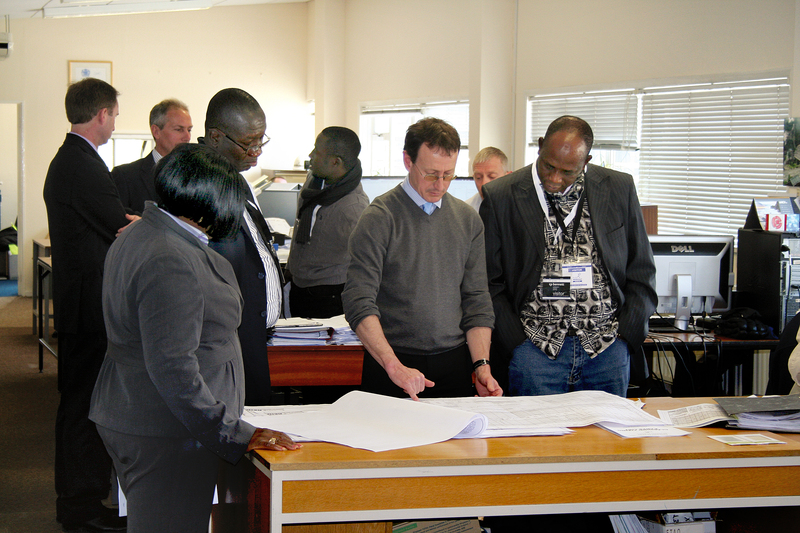 Working as part of the NMSI team, REIDsteel are designing, fabricating and shipping several district hospitals throughout Ghana for the Ghanaian ministry of health under a $175million contract. Mike Chappell, REIDsteel’s Sales Manager introduced our visitors to REIDsteel’s company history dating back to 1919 and talked about the vast range of technical expertise that we are able to bring to projects. He then went on to show a time-lapse video we recorded of the parts for the building being packed to be shipped to Ghana’s Tema Port.